If you would like to send us your testimonial, please complete the form on the right hand side of this page. Thank you for the excellent service! I work overseas and I couldn’t visit my daughter in the hospital but I wanted to brighten her day. Well it worked! 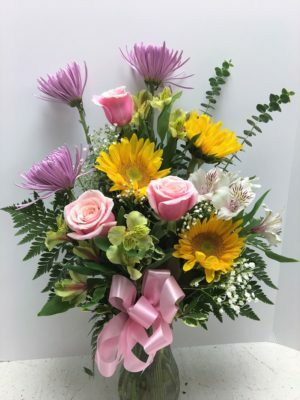 The fast delivery and beautiful arrangement really made her smile. Your ordering site is very easy to navigate. You’re the best! Those are beautiful. Thank you guys so much! and here’s the Thank you picture sent to me! She seems so happy! Thank you Tina and Pamela for helping me today! Thank you for your fantastic customer service and beautiful flower arrangements the last 4+ years. 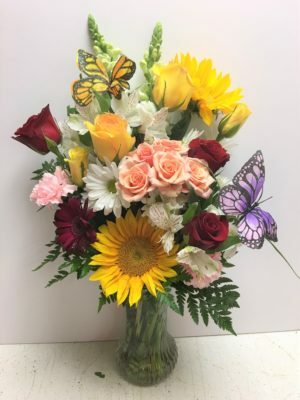 My mom was in assisted living and then memory care and I always knew I could call last minute and you’d have a wonderful arrangement delivered right away. It has been difficult living out of town, but your exceptional communication, care and concern has always been greatly appreciated. I loved the pictures I received of the arrangements and they were always perfect for her! Thank you!! 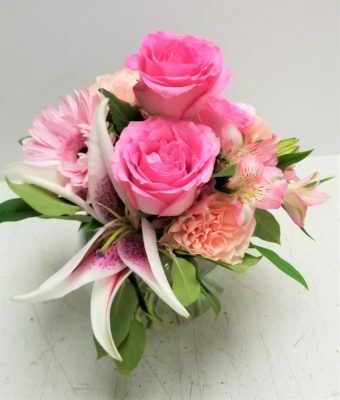 Beautiful is the only word I can think of to describe this floral arrangement that Pamela designed for Lucy and Andy McCain, the son and daughter-in-law of Senator John McCain. It is a difficult time for all of us, and especially for the friends and family. 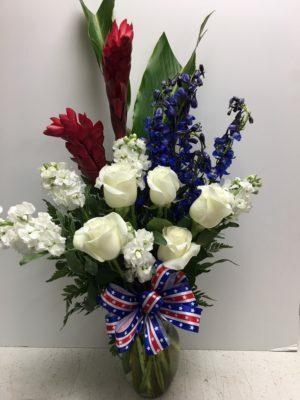 We are dear friends with them, and when I spoke with Tina and agreed to send red, white and blue, I had no idea what Pamela was going to design. Imagine my delight when Tina sent me a text with this picture just before delivery! It is impossible to convey the emotion we feel when we lose a loved one, but flowers always help the family recover. Thank you Pamela and Tina for this beautiful design and sentiment. congratulations beings one of the best 3 florists–however I”m not surprised. Tina & Pamela do a great job with their lovely arrangements. I have always been thrilled with all the flowers they’ve done for me. Thank you, those are very pretty. Tina, just wanted to thank you for your kindness on the phone today in helping me to process my order on your website. 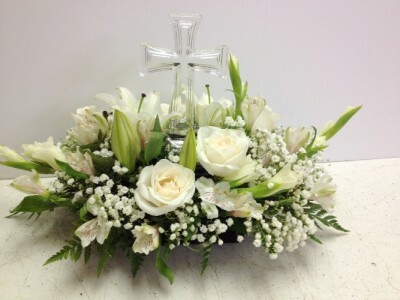 I was able to do it successfully and order the flowers for my cousins funeral. Thank you! I have already heard back from Nicole and she said that she loved the plant! Thank you so much for making it special. Beautiful work. Tina made a gorgeous piece of art for my girlfriend’s birthday with just a few ideas from me in terms of color and style. 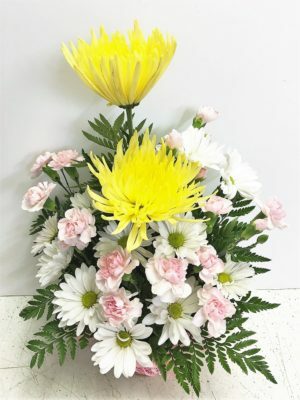 You can trust them to create something beautiful and make your loved one happy. Thanks Roadrunner! I have been going to Roadrunner Florist for a couple of decades now and I would never go anywhere else. Tina is always so helpful and goes out of her way to help with special suggestions and make sure that the gift is delivered to the right place at the right time to the right person! I never have to worry about anything once I’ve place my order with her! And I *always* get raves about whatever I send, flowers always last a good long time and they always look very pretty and special. Thanks! Thank you so much for doing that for me. I always order from you my 5th time coming back! 😊 I truly appreciate it, her favorite number is 7 that’s why I ask for 7 and the one rose to be special and the red n blue bow his her favorite baseball team the cubs. So it’s perfect, couldn’t do it without you thank you pamela! Thank you so much for your excellent service and beautiful flowers! You never disappoint! Beautiful bouquet!!! Def will be using you from now on!!! THANKS!!! MADE MY WIFES DAY!! 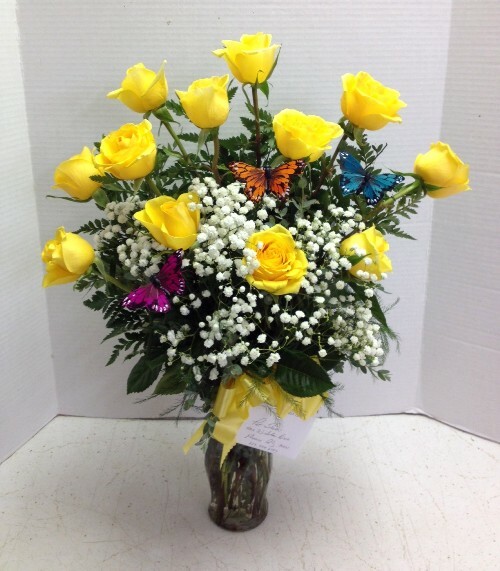 Ordered flowers for my sister’s birthday….she just got them and says they are BEAUTIFUL!!! I live out of state and found you on yelp. So happy I did. Thank you so much! Great job, Ladies!! 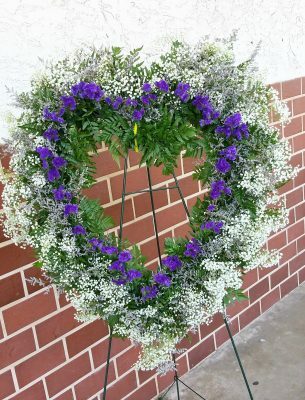 Everyone loved the flowers and Dave’s widow Beverly expressed how beautiful they were. Big Hugs To Both Of You!! 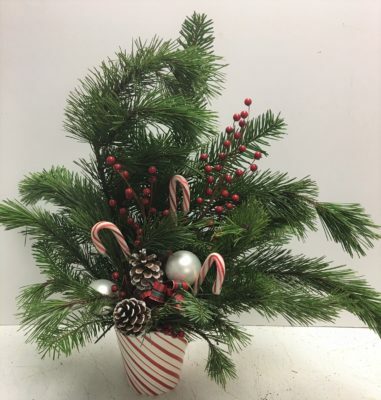 Thank you so very much for creating and delivering a beautiful Christmas arrangement. It couldn’t of been delivered on a more needed day. Our Aunt called to say it was both beautiful and smelled like Christmas. Thank you for your excellent service. 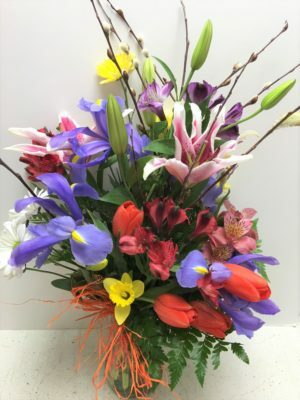 I called Roadrunner Florist today after finding them on Google. I spoke with Tina and told her I’d like to send a real pretty plant as a thank you. She was great, and I trusted her to do a nice job for me. Since I’m in the Great State of Missouri, I had no way of knowing what they were going to do. But boy, did they come through for me! First of all, it’s a holiday (Columbus Day) and she had to verify that Lois was working. She did that and then she sent me a picture of this beautiful plant by text. I think it’s beautiful and I told her she’s a “breath of fresh air and anytime she’s in Missouri and needs a job, I’ll hire her”! 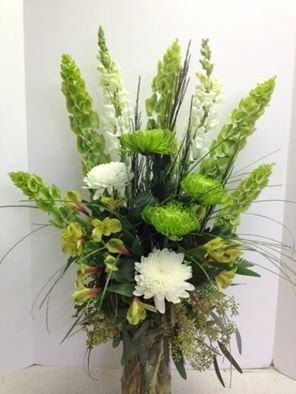 Looking for a florist that is personable and will make you feel like you’re part of the family? 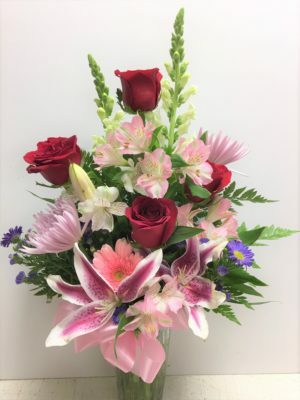 Look no further than Tina at Roadrunner Florist! 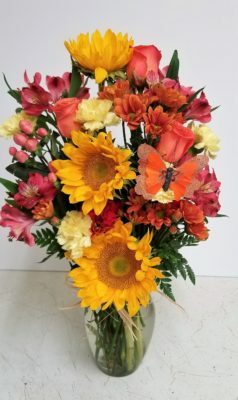 My mom and dad ordered the flowers for Amy, and they were delivered fresh the following morning, even before I got to the hospital to pick her up. Customer service is terrific! Amy loved the flowers! If there is one thing I can count on, it’s Pamela and her flowers! I asked her to re-fresh a silk floral arrangement she had designed several years ago. I brought in the basket and waited for her expertise. She called me 2 days later for me to pick it up. This is perfect for my home. It’s the garden style I wanted, with lots of flowers and colors, and she even made it so I can use it as a centerpiece if I want to. The price was even less than I expected to pay! You can count on Pamela, too! Thank you so much for calling me! Got a message from Deborah today along with a picture of the flowers that you delivered. She loved them. They were beautiful! Thank you again for the wonderful service! It really is hard to come by these days. Keep up the wonderful work. It is unexpected exemplary customer service!!! I have posted this experience on my Facebook and did a Yelp review. Besides being a customer for life, how can I best reciprocate? Tina, you did a FANTASTIC job with them. She absolutely loved them. Thank you so much for assisting me in getting the weekend off to a wonderful start. All I can say is WOW fast, excellent service! 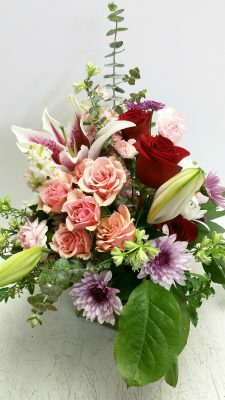 I called from California to send flowers to a friend in the hospital. Tina was on her way to service a funeral when I called and advised me to go to the website, and if I didn’t see anything I wanted she would call me back. I placed my order online with a request for a different vase. She called me back and explained my arrangement would not work that way and then gave me a very suitable option. From the time I placed the order to the time my friend received the flowers was just over an hour. My friend loved them and so did I! Thank you!!! Can’t say enough great things about Roadrunner! I was so nervous, we called from Tucson, but Tina answered all of my questions and was great!! She went above and beyond to ensure a smooth delivery at St. Joe’s hospital. Thank you, thank you for bringing a smile to our friend at not so great time. I will be telling all of my colleagues in Phoenix and Tucson about this gem. I even posted this on their Yelp page so everyone can see what a great job they do! I called from Michigan to have flowers sent to my Aunt for her birthday. Always very pleasant and helpful. Flowers are beautiful! Pamela, As always you girls are the best and greatly appreciated. Thank you so much for all you do. The flowers are beautiful. Thanks for sending me this picture, even before the flowers arrived at the church. They didn’t have too many arrangements at the funeral so they used it on the center of the coffin and then they used the yellow flowers to toss into the coffin with the dirt.I hope that’s not too much information, sounds morbid I know, but I was very pleased with what they were. Everyone was very pleased as well. Thank you again for all you do. The flowers I received on Friday were so beautiful! It’s Monday now and they’re still as fresh as they were when I received them! You made my birthday very special! Thanks so much! The flowers for my wife are spectacular! Thank you so much! Wow!! !what a wonderful experience with Roadrunner Florist from the time my order was placed to sending me a photo of what was sent for someone special on there Birthday this was very important to me for I live in the great state of Minneapolis, Minnesota and to know that the would receive quality service and a very good product not just that the customer service was awesome I recommend anyone to use roadrunner they are top notch.. and that is the truth Otis.. 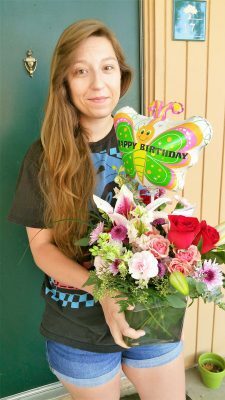 Thanks for the photo- flowers + balloons! 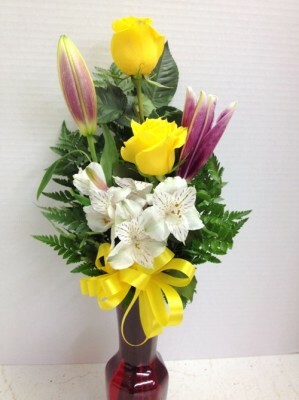 Definitely 5 stars for customer service & designed flower arrangements on both Yelp and Google! ? Tina, thank you for your kindness and your customer service. 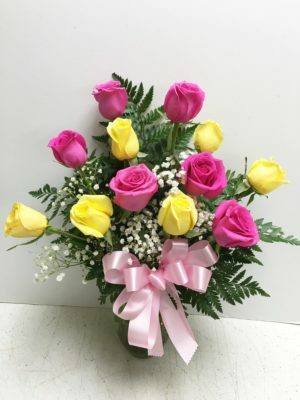 I called to order contemporary pink roses for my new granddaughter. 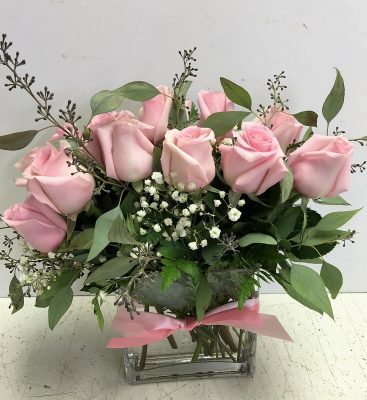 My idea was to send them to her with a note telling her “good luck with the folks!” I spoke with Tina and explained what I wanted, which was a short cube of a dozen pink roses with lots of greens and baby’s breath. It took less than an hour for the roses to be delivered to the new baby at her home, and they even texted me a picture of the flowers! 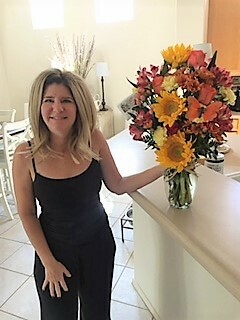 I’m very impressed with the customer service and the beautiful arrangement that was created for me at Roadrunner Florist. Yes, I would recommend them to anyone looking for a local flower shop in Phoenix! 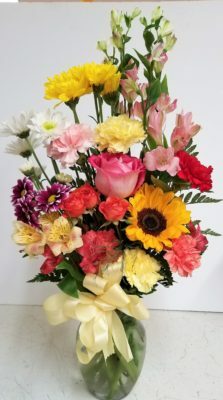 FYI I was impressed with the quick turn around on my order not to mention send a picture of the flowers .. you definitely won me over as a customer. I will definitely use road runner again and will recommend you to family and friends. We are in Scotland. Found Roadrunner on Yelp and contacted them about a large funearl spray for a dear friend in Phoenix. It took a few weeks for us to get the information together and then they designed and delivered. 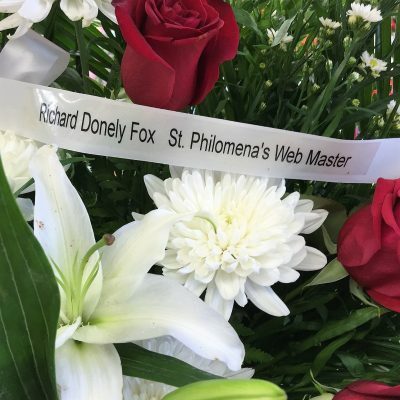 Mr. Richard Fox was a philanthropist and St. Philomena’s web master. 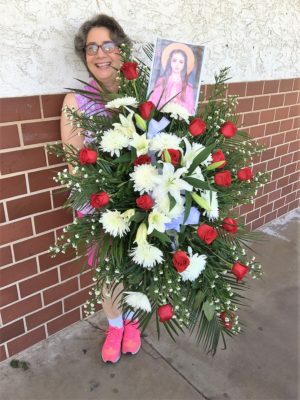 I asked for a small banner and for a picture of St. Philomena. Everyone here very happy. The flowers are beautiful everyone had commented on them. I believe there was many at the funeral. Hopefully you should get some more business from it. Many political figures there I was told. They even sent me these pictures. It was so easy to find you yesterday on Yelp! 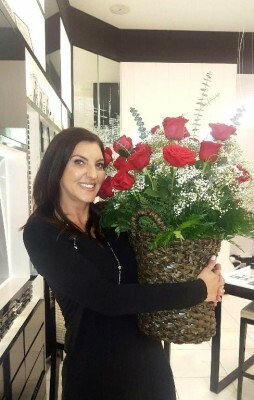 The flowers you sent to Lesley were perfect for her Happy Birthday Surprise! Thanks so much. Lesley is enjoying the flowers very much and was surprised. That was so good of you to do…. Never had that done before , really , really a nice touch!! You are first class and have a great company. I must tell what compelled Pam to send this email to me. 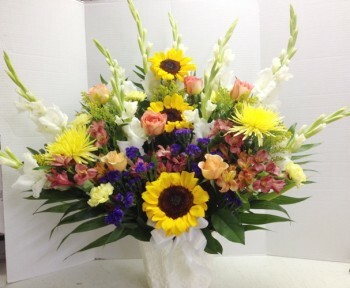 She ordered flowers this morning (by phone), after visiting our website and choosing the Softly Sentimental arrangement. But she wanted it designed in a cube. And she wanted it to be appropriate for a 25 year old’s birthday. She wanted to make sure it had soft colors, and she wanted it to be a surprise. She contacted her son (by email) to make sure he and his girlfriend would be home to receive the flowers the morning. In the meantime I designed the piece, sent her these pictures and made arrangements for the delivery. When I got to their apartment, I knocked on the door and no one answered. Bear in mind it’s 110 degrees outside and I wasn’t about to leave the flowers at the door. So I went to write back to Pam and tell her I would leave them at the apartment complex office, when Kaity opened the door! I handed the flowers to her and I took her picture! Then I sent the picture to Pam! Well, you can tell from the email that Pam was THRILLED! That’s why she wrote that it was “so good of us to do”! This is why you contact a #local #flower shop! 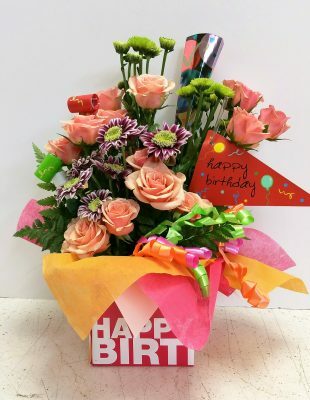 We are so happy that Pam found us on #Yelp and that we were able to design and deliver the #birthday #flowers to Kaity! Thanks again, Pam, for the great review! We look forward to hearing from you again! I must tell you about Roadrunner Florist. I found their website on #Yelp. Yes, I read that people love them on Yelp! It’s no wonder! First of all, Yelp things they’re great. Then if you visit their website you’ll find it’s different from all the rest. The pictures are beautiful. The descriptions are ok, too. And ordering was as easy as can be! 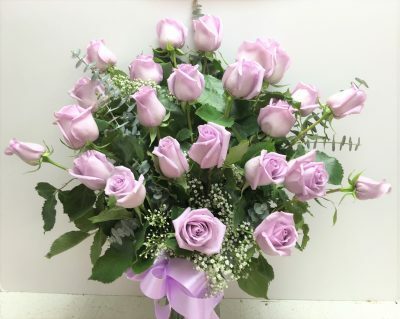 I ordered these flowers for my mom’s birthday. When they processed the order and went to write the card, they realized I had forgotten to put my name, and guess what? They called me! Yes, by phone, and they asked me if I wanted my name (they said some people don’t, but I think that’s a bit weird!). Anyway, of course I added my name to the enclosure card. The next thing I knew they sent me 2 pictures of the flowers! Wow! Then I Heard from my mom that she had received them and they were really prettier than the picture! Would I use them again? You bet. Would I recommend them? You bet!! 10 stars to Roadrunner Florist! I’m back to Yelp to give them a great review! 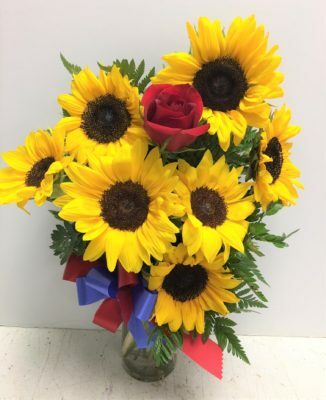 I ordered 6 sunny sunflowers (they sent 9) to be delivered to a funeral in Phoenix. I didn’t know the address of the church, but Tina did. I didn’t know the time of the funeral, but Tina did! 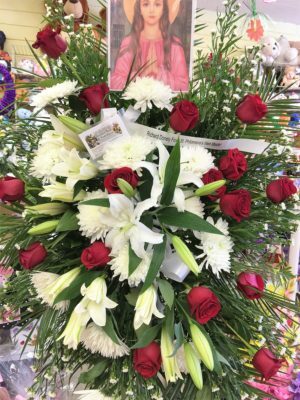 They even sent me a picture of the arrangement before it left the store (they explained that they couldn’t take a picture inside the Catholic church). 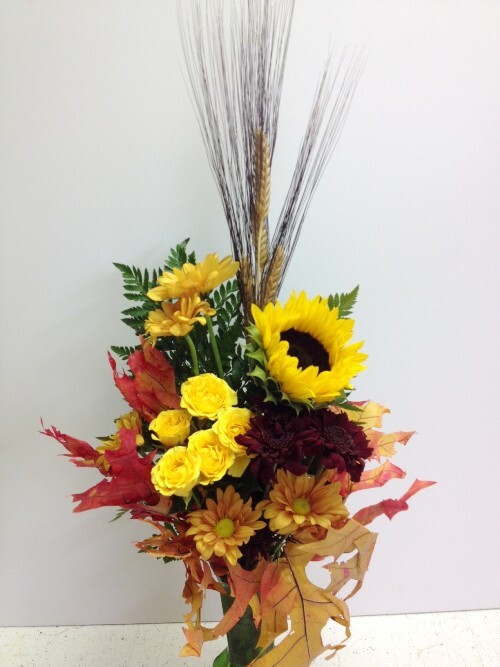 Kudos to Roadrunner Florist for their great service and beautiful sunflowers! Thank you so much for your assistance with this order and sending me the receipt. The flowers are beautiful and I’m sure Nan will love them. We will definitely keep you in mind for future orders! You ladies are the BEST. 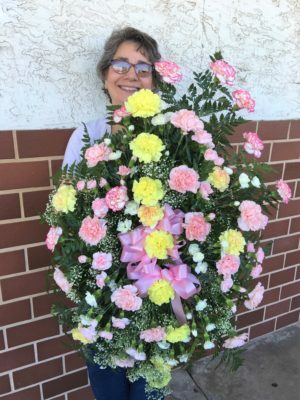 Our family ordered all of the flowers for my Mother’s funeral from Roadrunner Florist over the phone, from North Carolina. We had a concern in doing that hoping they would be really nice, but knowing that way we could be sure we would have several complimenting arrangements. We couldn’t have been more pleased. Everything was fresh and beautiful. Drew had all the arrangements delivered early and even helped with setting them up. And providing cold water for us, knowing most of us attending were from out of state and not accustomed to the summer heat was a Blessing. We can’t thank you enough to help make Mom’s funeral service as beautiful as the life she lived. So from all of US we say “THANK YOU-THANK YOU-THANK YOU.” And from me, “BE BLESSED”, you were a Blessing for us. Roadrunner Florist is amazing. The woman who took my order over the phone was delightful. She answered my call at 9pm and delivered beautiful flowers the next day. She was so pleasant and love. Most importantly, she genuinely seemed interested in my order and the happiness of its recipients. Everyone in Phoenix should get their flowers here! The flowers you designed are absolutely beautifully stunning!! Wow wow! Even more than I imagined!! Just like u said they would be. I’m sure Kaylyn will be wowed!! And I can’t wait!! Thank u so very much!! It was a pleasure to meet u too. And I will visit u again!! And tell all my friends!! I love them!! Thank u!! A week later and the arrangement is starting to lose petals, a testimony to how fresh the flowers are that you use! It cheered me every time I looked at it! Testimonial: A 5 star review! The least I can do is write these lovely ladies a 5 star review. it all starts with a phone call, well technically a Yelp search. 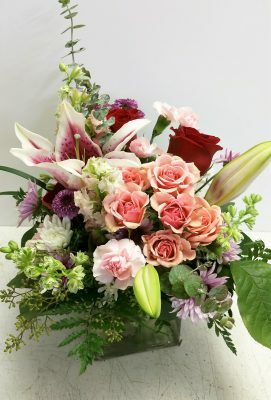 Not only did I find a florist with nothing but 5-star reviews they are extremely close to my girlfriends work so that should make delivery easier. Their profile says they’re closing in 19 minutes so I didn’t expect a phone call back that day but about a 1/2 hour later I got a call from Tina returning my phone call after they had already closed up shop. So I give her my crazy plan which is to flood my girlfriend with deliveries every hour while she’s at work. Tina told me they might not be able to accommodate my crazy idea for all day but she will definitely see what she can do. She tried all weekend to get a hold of her drivers and see what kind of magic they could perform. She couldn’t do all day but she could do a couple so instead I decided to go big or go home. I ordered 3 dozen red roses and then a Hawaiian bouquet. I ran to Michael’s and picked up 2 crazy baskets and dropped them off on Monday so that they could make their floral arrangements in these baskets. Not only did these ladies build a beautiful arrangement of flowers but they were able to make 2 deliveries for me so I could make today rememberable forever. Only problem is I set the bar a little too high for next year, lol. These ladies have a customer for life! Tina, big thanks for sending flowers to my cousin Nicola and auntie Ida in England this last weekend. Both of them are thrilled to bits. You are just the Best. Many thanks Tina. Have a Grrrrrrrr8 Day. from Chris. 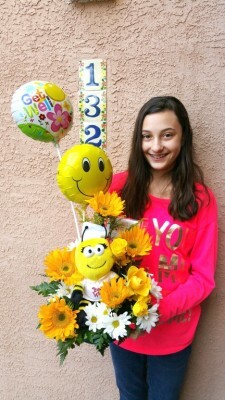 Here’s a picture of my granddaughter holding the happy bee well flowers she got the other day! I think they helped her get better soon! Thank you for the wonderful Starry Starry Night arrangement, they are beautiful. You guys have earned my business. 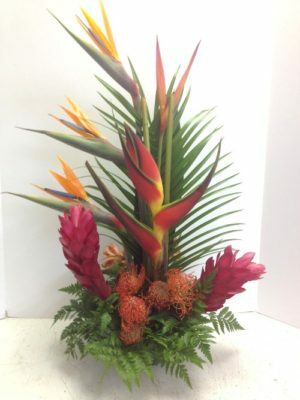 I recently sent Birds of Paradise and More to my mom on her 86th birthday and wanted to let you know how pleased we were with the gorgeous arrangement. It is quite spectacular! Mom loves it and is enjoying it so much. After years of searching for florists in the Phoenix area as well as online shops, I am so happy to have found you! Better Than an OnLine Service! Thanks for doing a great job with the flowers for my step-mother’s birthday. She said they were very pretty and they got to her early. So much better than using an online service. Thanks again to guys were awesome! 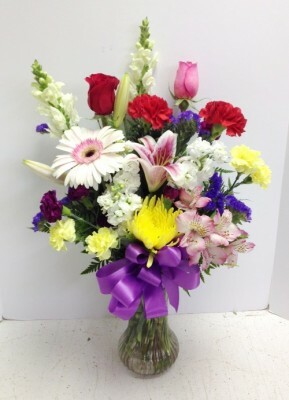 We loved the fall flowers you sent to Cheryl for her birthday! Everyone Loved the Gift Baskets! Just wanted to let you know that everyone loved the gift baskets!! Thank you so much for making me look good! Thank you, Pamela! The flowers are beautiful! 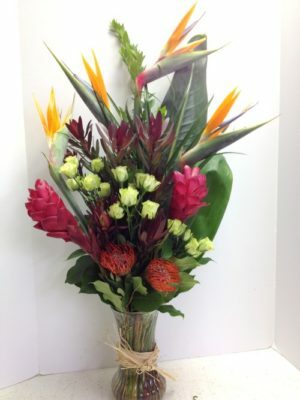 Designer, Pamela and Roadrunner Florist are awesome! 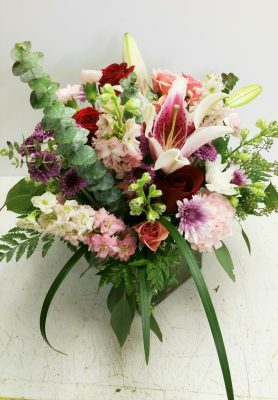 After reading other customer testimonials on the website and positive reviews on Yelp, I called to order a home bouquet for my sister-in-law who lives in Phoenix area. My family couldn’t make the trip from Wisconsin to attend her husband’s memorial service, so I wanted something vibrant and colorful to reflect his joyful spirit and convey our love. Tina was a delight to talk to. She captured my wishes exactly, the flowers were extraordinary…everyone thought they were beautiful. Tina also called my “sis” to prearrange a special delivery for Sunday (when the shop is normally closed) so the cut floral bouquet would be fresh for the early Monday service. Then Tina sent me an email with photo to let us know the flowers had been delivered. Tina is creative plus caring….she helped us connect across the miles with our Arizona family. We encourage you to use Roadrunner Florist & Basket Express. You guys are the best!! Thanks again.. Without a doubt very happy and will make sure to give you an excellent rating… I have alot of friends in AZ and ill be using your services again count on it! There is not another person in the world that I would rather have carnating (person who does carnations) me than the Road Runner over there at Road Runner. She is the greatest and knows how to carnate with the best of ’em. Over the past week my family suffered a loss of a sister. Some of you know that I have an alter ego, BB Clown. As my sister-in-law lay in the Hospice I decided that BB needed to visit her one last time. 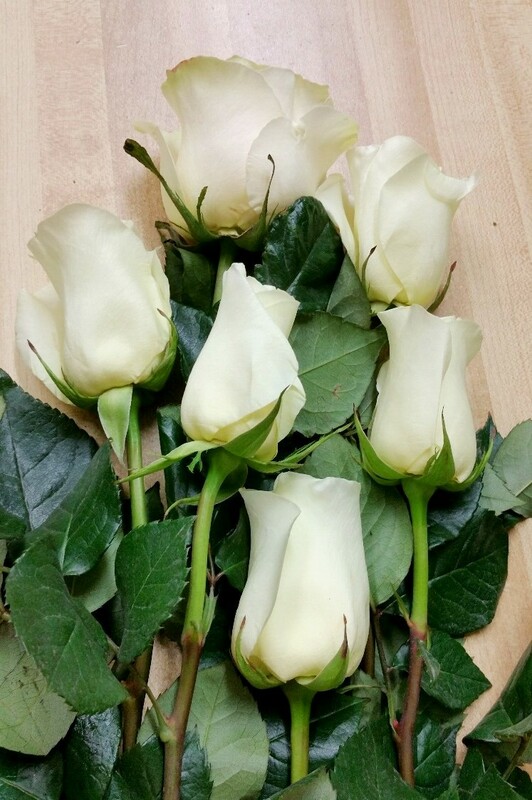 I dressed in my Tramp Clown and stopped by Roadrunner Florist and picked up a half dozen white roses. These roses originally were going to be given to one person, my sister-in-law, however, while I drove to the Hospice I thought of others that I had seen there. Since I was blessed by a gift of love from my friend Pamela E Smith at Roadrunner Florist I decided to spread the blessing. Let me get to the point. BB Clown was able to bring a smile and some laughter to friends, relatives and patients a their final stages of life. As I left the Hospice one of the family members of a stranger whom I stopped in on and laid a white rose on their bed chased me down. She was just wanting to thank me for that small act of unselfishness, a single rose, a prayer and the smile on her papa’s face. They had not seen him smile for a long time. 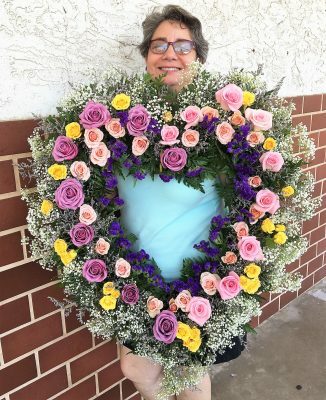 If you want to see a miracle from laughter and a smile, go by Roadrunner Florist and Basket Express. 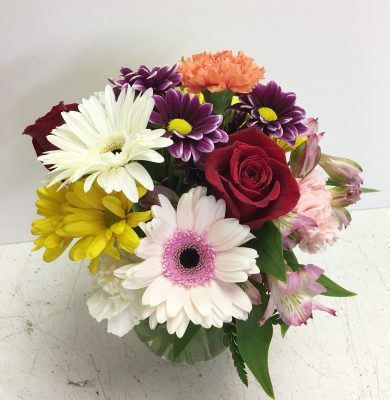 Pick up some flowers or a gift basket and watch the smiles come. 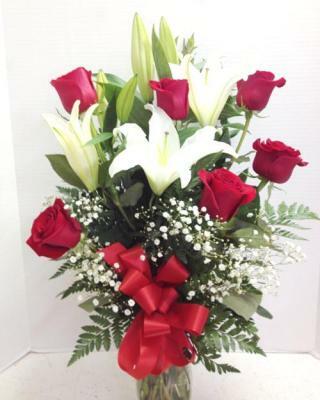 Take it from a long time satisfied customer of Roadrunner Florist & Basket Express. I just received the most beautiful flowers from my niece for my birthday. I called Roadrunner and asked for the person who designed them, and it was Pamela. I couldn’t wait to tell her that I had never seen anything like this! Then I called my niece and told her. Very happy people here! I highly recommend what they call their Hawaiian Paradise! I purchased a centerpiece for a funeral a few months ago. It was so beautiful that the person I sent it to took it to the funeral home for the sign in table, she loved it so much. 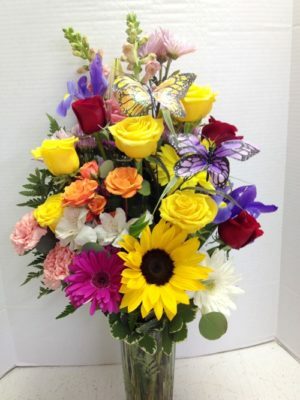 Today I called and ordered a flower arrangement for neighbors that had just lost their daughter. My neighbor called about 4 hours after I ordered it, so happy, telling me how it was the most beautiful flower arrangement she had ever seen! 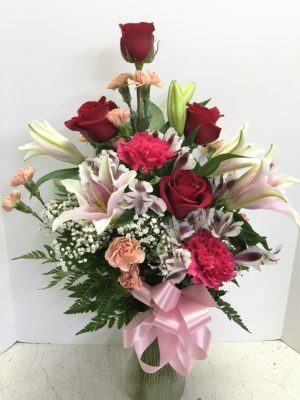 She said “Who could ever be sad looking at such beautiful flowers, thank you so much for sending them!” This florist shop in my opinion is the best, I live in Glendale and love the customer service and products so much I will tell you to use them as your florist, you won’t ever be unhappy! They ROCK! I am certain that I have a different insight than most customers. Why? Because I was Tina’s accountant for many years prior to retiring to Vermont. I suppose one could assume that makes me a bit prejudiced and maybe it does but there are some things every customer should know about Tina and Pamela….the customer always comes first and they will work tirelessly make sure that their business and your satisfaction with their product gives you reason to NEVER consider another supplier for your gift basket and flower needs. It just doesn’t get any better than that. Tina’s baskets are as fresh and original as they were 20 years ago when we first met and Pamela is an artist with flowers as her brushes….these women will paint you a memory not soon forgotten. Thank you so much for your help getting flowers to my mother, Virginia Markham, at St. Joseph’s Hospital. I greatly appreciate your dedication to customer service. My mother loves the flowers and often mentions how they cheer up her room. 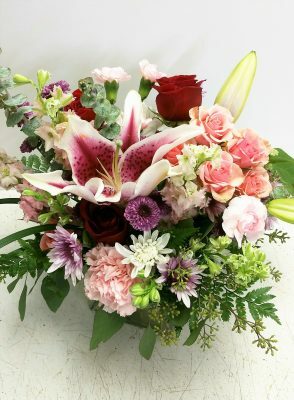 It was a very difficult and heart breaking circumstance, of the passing of my brother, that I reached out to Roadrunner Florist through my search on the internet. I could not have found such personable and compassionate people as Tina and Pam. Not only their personable touch, making sure that my order arrived the same day, but they go that extra and notified me that delivery was made and sent me pictures. Thank you Tina and Pam – you are OUTSTANDING! We live in PA and called to have a bouquet of gladiolas delivered to our mom on her 80th birthday. When they could not reach her for delivery, they went the extra mile to call us to make sure they could be delivered and not get ruined. 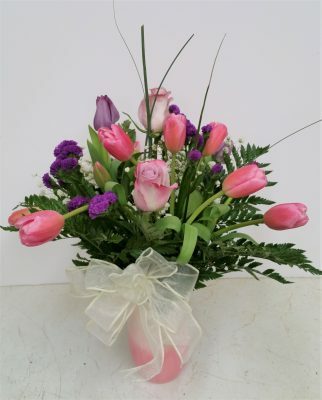 Our mom absolutely LOVED the flowers and from the picture we saw–they were stunning. Thank you so much for the real care and concern that you showed. We will definitely remember to use you again when the occasion comes up!! As a volunteer with a public education advocacy non-profit we are challenged with the desire to express appreciation to dedicated educators, community members and parents while at the same time, being fiscally responsible with all donations given to the mission of the organization. Roadrunner Florist has beautiful, diverse floral and gift basket options at various prices. This allows me to choose Roadrunner Florist as a local business, keeping much needed tax dollars in Az #LocalFirstAz, express appreciation #Delightful! and be able to afford to pay personally #ReasonablePrices. 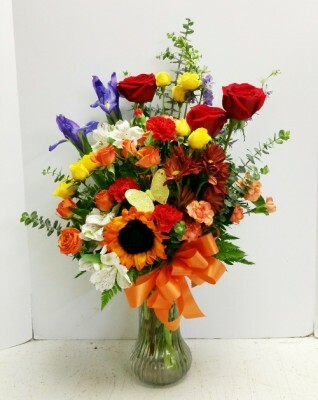 RoadRunner Florist is like winning the Trifecta! They really do live up to their name. I called ahead to let them know that I was in a rush and they told me not to worry that they would have something ready in 45 seconds that was in my price range. They had my bouquet ready in the time frame promised. So refreshing to have an affordable florist that will save me from another boring supermarket bouquet. We wanted to send a few starving students we know some yummy treats, plus their 3 dogs. We feel blessed that we found Roadrunners/Basket Express. We were able to send gorgeous arrangements of fruits, vegetables for the kids, and milk-bones and toys for the dogs. Tina was so helpful in bringing it all together. We are truly grateful. I am calling to tell you my mother, Winnie, passed away in June. Every time I called and ordered flowers and you delivered them to her she said she was really happy with you guys and she said the flowers were always “gorgeous” and I’m really glad I came in to meet you, even for only a few minutes when was down to see her. I have more friends in Phoenix and I’ll be calling you again. Thank you for taking such good care of my mother for all those years. Boy, am I glad I found Roadrunner Florist. I was looking for a gift for a friend in at St. Joseph’s Hospital. I hunted all over the Internet (most of the listings aren’t real flower shops anyway) and then I called the hospital. They recommended Roadrunner Florist. I’m so glad they did! Anyway, I spoke with Tina. She’s terrific! She owns Basket Express, which she told me is a gift basket shop inside Roadrunner Florist. Anyway, my friend was in the ICU at the hospital where she couldn’t have flowers, so Tina suggested I send cookies and fruit with a teddy bear and a couple balloons. Let me tell you, that was the best idea ever! My friend was able to enjoy the goodies and share them with her family and even the nurses at the hospital! I would recommend Tina and Roadrunner Florist and Basket Express any time! They’re great! So I stopped in today to do a little last minute valentines day shopping for my girls. Pam and Tina went beyond the call of duty to help me out with the roses for my wife and carnations for my daughter. I will be back for all my needs. FYI it helps if you are outfitted in Michigan State gear. I found Roadrunner’s website while searching the web, and I sure am glad I did. 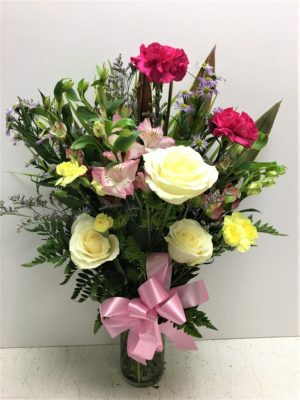 I ordered flowers for my daughter’s birthday, then when my mother was in the hospital, and then for my son’s wife, all in less than 3 weeks! Let me tell you, this was easy to do and the arrangements were all beautiful. The flowers lasted lots longer than we expected, and everyone was thrilled. The experience was much better than my past dealings with online flower sellers (I had used 1800flowers and ftd and proflowers in the past) and I’ll NEVER go back to them again!! Call Roadrunner . You’ll be glad you did! Good Old Fashioned Customer Service You Can Count On! – WOW! 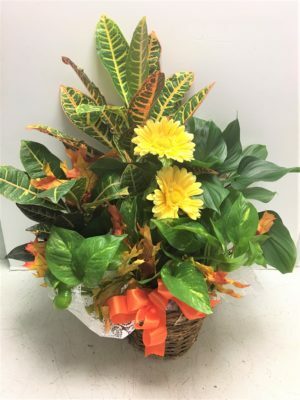 Not only did Tina take my order on a Sunday morning, she went to the shop after hosting a party at her home to create my arrangement, and personally delivered it to the hospital for my new great nephew! Then, she called me at home to let me know the arrangement had been delivered, and offered to post it on Facebook so I could see it too. Now that’s the kind of customer service worth bragging about! I won’t hesitate to use Roadrunner again, and I’ll recommend them to my Arizona friends and family too! Tina, you rock! WONDERFUL Local Shop – Roadrunner Florist is a delight! Every time I call I know I’m going to send exceptionally fresh flowers, delivered just when I need them. They call before they deliver the flowers (yes, you might think that ruins the surprise, but have you ever had a florist deliver flowers to a neighbor or worse yet leave them outside) and they’re always beautiful. No delivery in a box here. I woudn’t lower myself to that anyway, and neither should you. I even went into the shop last week and they gave me the “nickel tour”…worth a dime! You should see all the vases and containers they have to choose from! Next time I’m going to be even more specific (I think I’ll pick purple) and I know Roadrunner will do a great job! THANK YOU FROM ENGLAND!! You two lovely ladies are amazing. You look after us like family. The arrangements you do for my mom in Phoenix are nothing short of brilliant. You always make her feel extra special. The latest…the fruit and flower bouquet was superb and the printed photos were such a personal touch. She LOVED the cookies! Thank you so much for caring for your customers the way you do. You’re the best! 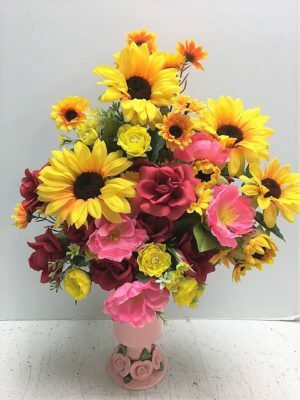 Pamela and Tina – I live in Virginia and contacted Road Runner to order an arrangement for my daughter-in-law’s 40th birthday. Tina was so helpful and understanding of just what I wanted. 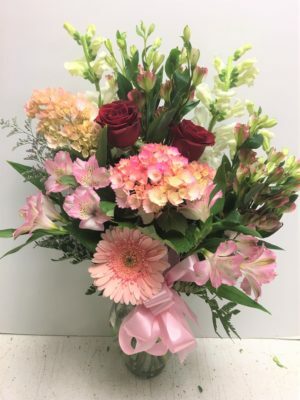 My son sent me a picture and the arrangement was absolutely gorgeous – full of pink just like I told them was her favorite color. Also, I received a wonderful, personalized thank you note from Tina and Pamela in the mail. What a special touch! It is rare to find such excellent service these days – I so appreciated it! I got in touch with this company by accident and I am so glad! 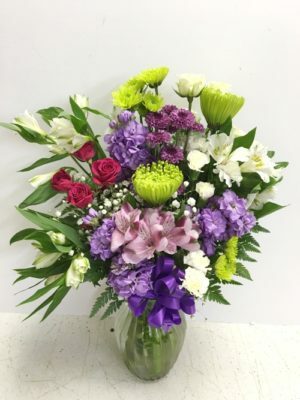 I am located in St Louis MO and they were still able to ship an awesome bouquet all the way here for my lady. She was ecstatic! Thank you so much Tina and Pam for everything and I will definitely be back. You have earned a customer for life! Does this type of personal customer service still exist? Yes, if you are lucky enough to find such places- and this is one top-notch florist. I live in Chicago and wanted to order a special plant for my Phoenix friend. From the minute Tina answered the phone, I was confident that my order was in good hands. The attention she gave to choosing the plant, describing all others, and sending me a picture (without my asking!) is almost unheard of these days. 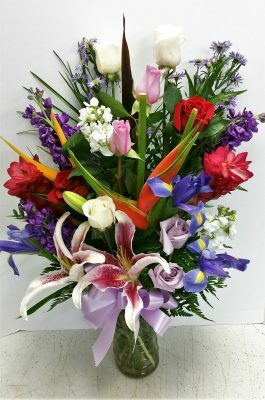 Anyone from out of town wishing to send flowers to the Phoenix area- hear this: This is The Best Service you could possibly wish for. And the plant was absolutely stunning! Pamela and Tina – Thank you for the outstanding flowers. It has brighten up my day today. Tina is very patient and AWESOME to work with. Wood Arts Universe will definitely come back to Roadrunner for unique gift baskets and flowers..! 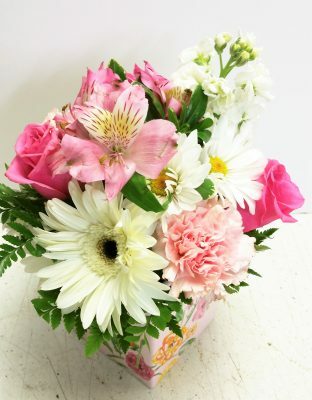 many times I hesitate ordering things online … I was hoping you would get my mom’s basket to her on time. I have to say, after speaking with her a while ago, YOU KNOCKED IT OUT OF THE PARK! She is quite pleased with her flower/fruit basket and I wanted to say THANK YOU for doing such a great job for her and getting it delivered on time! pamela and tina I have so enjoyed seeing the photos of the lovely bouquets you all make. the one you made for my moms 90th birthday last year was so appreciated.. at 91 last September she got a smaller one from the local store as we were moving again to be closer to her. she passed away in February of this year and sitting here looking at the pictures today I remembered that I never truly thanked you for that bouquet. it seem to last forever. we will now be moving back east where we have a more normal change of seasons in a couple months. but will keep your site up to enjoy. I have only known Tina for a brief period of time, but I feel like I have known her forever. Tina is the nicest and most professional person to deal with, and is extremely conscientious! Basket Express/Roadrunner Florist will definitely be my “go to place” the next time I need a floral arrangement or unique gift basket! I have been into your store for various floral and gift basket orders and was delighted with the beautiful results. I came across your business card and just wanted to thank you for staying in my neighborhood and also to send my best wishes to you both and for your business. I appreciate small business owners. 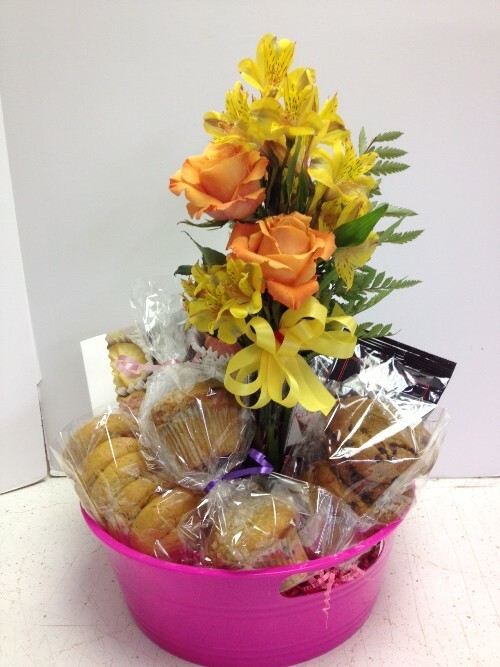 You should definitely use Basket Express & Roadrunner Florist when you need flowers or a gift basket! Tina and Pamela are AWESOME! I am the executive administrative assistant for a local airline, and I’m here to tell you when I call Tina and tell her what I need, I never ever have to worry about at thing! Calling them means one less thing on my “”to-do”” list! The gift baskets are unique and beautiful. You should see the baby baskets she has done for us! And when someone passes away, I always call and they know just what to send to express our most sincere sympathies. I use them whenever I have a need for flowers and gift baskets, and they deliver or ship everywhere. At Christmas I put them to work and they design our gift baskets for all of our corporate members. They have used Hawaii, and China as themes, and especially Southwest. I know they will always send something wonderful. Go, Tina and Pamela! I hope you are in business for another 40 years! This is the place I keep telling everybody about! One of those little hidden treasures in the valley. A couple of wonderful ladies who I’ve done business with for over 20 years and I won’t go anywhere else, especially not for the cheap stuff sold elsewhere. How wonderful it is to work with a competent, local company! I called Tina at Basket Express and ordered a gift basket as a thank you. The basket was delivered within the hour, and it contained exactly what I asked for. A magnificent selection of goodies! Yes, she also carries items for babies, and weddings, and new homes. She was telling me about all the special occasions and the flowers from Roadrunner Florist. I’ll be using her again and again! Thanks, Tina, for a job well done! would highly recommend this florist for local and out of town customers. Here is a picture of the amazing funeral flowers they sent for me. I think they’re amazing. I highly recommend Roadrunner Florist. Tina – I have been doing business with these ladies at Roadrunner Florist and Basket Express for some 12 years now. I have always found their customer service to be of the highest standards and integrity. I have stopped in at the last minute of the day and needed Flowers arranged and they stayed late to make up my arrangement and did not charge me extra for my last minute emergency. I have requested some very demanding items from this company, (I give to my clients as thank you gifts) and they have never let me down. 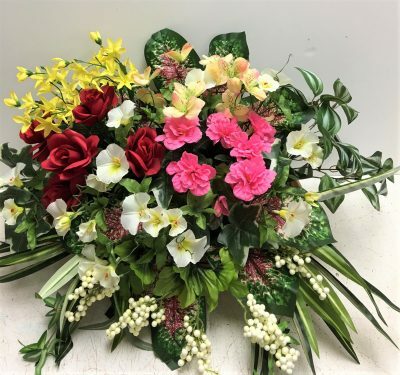 I have purchased Roses, (long stem and arrangements) holiday arrangements as well as funeral arrangements, I have purchased custom Gift baskets and as I stated never once have I been disappointed. I would recommend this company to any businessperson who is looking to show their appreciation to their client. * Your full name will not be displayed with your testimonial.